There is a lot of hype surrounding apple cider vinegar. Claims abound that apple cider vinegar is a magical cure-all that can help you do everything from lose weight to control acne. Others claim that drinking a daily dose of apple cider vinegar can even help you live longer. But, does the hype about apple cider vinegar live up to the reality? Let’s take a look. Apple cider vinegar, which is also known as ACV, is an amber-colored vinegar made from crushed apples. It’s considered by many to be a health- and money-saving panacea. Hippocrates, the father of modern medicine, even used vinegar to cure his patients. It’s strange to think that thousands of years ago, apples were generally not used as food. Smithsonian Magazine reports that until recently, apples were too bitter to be palatable. Instead, people pressed the fruit to make juice and left it to ferment and turn into apple cider, or apple cider vinegar. 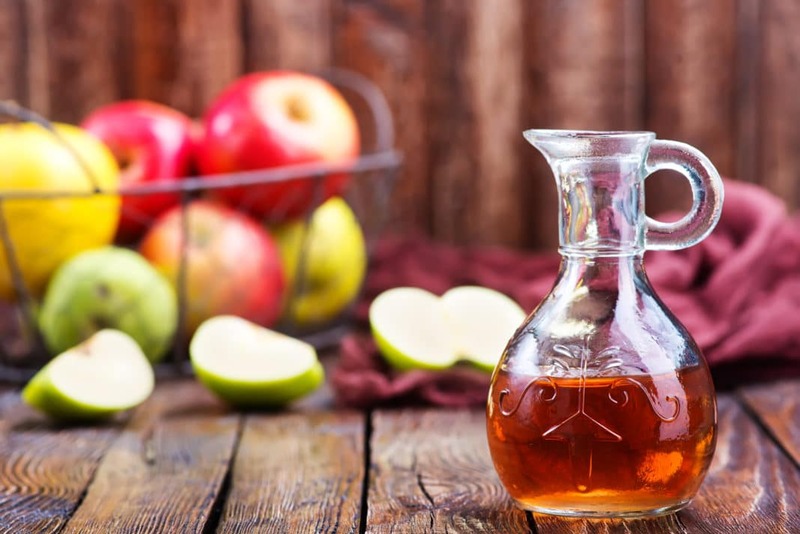 Vinegar, including apple cider vinegar, has been used since the dawn of time as a natural folk remedy.The ancient Egyptians used vinegar in healing and food preparation, dating as far back as 3,000 B.C, where vinegar residue was found on the inside of urns. It was considered a strengthening tonic for Roman soldiers, who were urged to drink it to maintain good health. The word “vinegar” originated from the French words vin aigre, which literally means “sour wine.” It can be made from a wide variety of carbohydrates, including wine, honey, molasses, berries, pears, and of course, apples. You can turn any alcoholic drink into vinegar. Once the beverage is exposed to air, bacteria can get in and start the fermentation process by turning the alcohol into acetic acid. Give it enough time, and you’ll have a bottle of vinegar on your hands. Head out to the grocery store and you’ll likely see two different types of apple cider vinegar: filtered and pasteurized, and unfiltered and unpasteurized. Pasteurized and filtered apple cider vinegar will be pure and golden in color. It will also be less expensive. Unfiltered and unpasteurized apple cider vinegar will look cloudy, and there will likely be a layer of sediment at the bottom of the bottle. This is because unfiltered apple cider vinegar still contains “the mother,” which is a web of cellulose and bacteria that helps the apple cider turn into vinegar. Most of the time, unfiltered and unpasteurized apple cider vinegar is organic. The only difference between the two is the presence of “the mother.” Deciding which type of apple cider vinegar to use is challenging, because there is no clear answer. Some people believe that “the mother” is rich in beneficial enzymes and proteins, both of which are destroyed in the pasteurization process. You can use unpasteurized, unfiltered ACV to make your own vinegar at home, but you’ll pay a bit more for this. If you want to get the full benefits of apple cider vinegar, stay away from any brands that say “apple flavored” on the label. This means that they likely used apple juice, not real apples, so you might as well be drinking straight vinegar for all the good it will do you. You should also look for apple cider vinegar that’s made in the United States or Europe. There are brands of ACV that are made in China and sold here in the US, but because regulations are so much looser there you’re likely better off sticking with domestic ACV. You might also get a better or richer vinegar if it’s made in a state where apples are widely grown, such as Washington, Michigan, New York, Pennsylvania, California, or Virginia. There are many locally-made ACVs that you can find online, or even at farmer’s markets in these states. Last, it’s relatively easy to make your own apple cider vinegar at home. If you score a basket of local apples at your farmer’s market or u-pick farm and need to figure out what to do with them, consider making your own vinegar. This tutorial by Wellness Mama is simple and straightforward. Some of apple cider vinegar’s benefits are backed by modern science, while others are nothing but hype. Here are the best uses for apple cider vinegar that will help you save money and live a healthier lifestyle. Apple cider vinegar shows real promise in helping control blood sugar levels. A study published in Pharmaceutical Sciences found that apple cider vinegar had a significant effect in reducing blood glucose levels in diabetic mice. Another study conducted by researchers at Arizona State University and published by the American Diabetes Association (ADA) found that apple cider vinegar increased insulin sensitivity to a high-carbohydrate meal in patients with Type 2 diabetes. It may also delay or prevent Type 2 diabetes in people at risk for developing the disease. Incorporating apple cider vinegar into your diet, especially by drinking it mixed with water before a meal, could help control your diabetes and help you rely less on prescription medication over time. And because regular consumption of apple cider vinegar might delay or prevent the disease, it could have a seriously positive impact on your long-term health. One study conducted by a graduate student at Arizona State University found that apple cider vinegar can be effective in reducing heartburn. While the study was small (only 15 participants), it was a placebo-controlled, double-blind study, which is the gold-standard for scientific research. Apple cider vinegar can be effective for managing heartburn symptoms because it helps balance your stomach’s pH by neutralizing stomach acid. Some heartburn is caused by too little stomach acid, rather than too much, and ACV can help alleviate this problem. Yes, apple cider is an acid (which might make you think that consuming it would make heartburn symptoms worse). However, when it’s consumed, apple cider vinegar becomes alkaline. Another benefit is that because apple cider vinegar increases the speed that your stomach digests food, it can reduce bloating. Apple cider vinegar might not work for everyone to control heartburn symptoms; this depends on what’s causing the heartburn. But if it does work for you, using ACV instead of over-the-counter medications could save you money, and reduce unwanted side effects. Apple cider vinegar might also be a healthy addition to your diet if you’re trying to lose weight. A study published in the Journal of Agriculture and Food Chemistry found that acetic acid (the key component in all vinegars, including ACV) helped mice ingesting a high-fat diet develop less overall body fat. Another study, published in the journal Bioscience, Biotechnology, and Biochemistry, studied the effects of acetic acid on human participants. They found that after 12 weeks, “body weight, BMI, visceral fat area, waist circumference, and serum triglyceride levels were significantly lower in both vinegar intake groups than in the placebo group.” In this study, participants consumed either 15 ml or 30 ml of vinegar daily. It’s important to keep in mind that both of these studies examined the effects of acetic acid, which is found in all vinegars. If you don’t like the taste of apple cider vinegar, other vinegars, such as balsamic or red wine, might also help you lose weight. Using diluted apple cider vinegar to clean fresh produce can be much more effective than plain water, or even those pricey vegetable washes found in the produce department. A study published in the International Journal of Food Microbiology found that a mixture of vinegar and lemon juice reduced Salmonella typhimurium on fresh vegetables to undetectable levels. To get the maximum benefits, mix apple cider vinegar and lemon juice (at a 1:1 ratio) in a small spray bottle. Spray produce, let it sit 15 minutes, then rinse. Apple cider vinegar is an excellent natural cleanser because it’s completely safe for your family. It doesn’t release harmful gasses into the air (called “off-gassing”) like many commercial products. Apple cider vinegar will also save you money because you can use one product to clean many parts of your home. ACV has powerful antimicrobial properties. One study found vinegar to be markedly effective in the prevention of bacterial food poisoning, making it a great cleanser for your countertops. You can mix apple cider vinegar with several other ingredients to increase its cleansing power or simply give it a more pleasant smell: lemon juice, alcohol, and salt are all good options. Use a 1:1 ratio of vinegar and water to make an effective – and green – cleaner. But don’t mix apple cider vinegar with baking soda unless you want to unclog a drain; the baking soda will negatively affect the ACV’s antimicrobial properties and make it less effective. Use undiluted ACV to remove ink stains from countertops and tables. I have two toddlers, and apple cider vinegar is a sanity-saver when they get a hold of a pen. Add one cup of apple cider vinegar to your laundry to clean and sanitize clothes. ACV also makes a great cleanser for cloth diapers. Use ACV to remove yellow stains from clothing. Use a 12:1 ratio of water and vinegar. Soak the clothing in the diluted vinegar water overnight, then wash the next morning. Mix a 1:1 ratio of apple cider vinegar and water to clean grease from your stove and the walls in your kitchen. Use straight apple cider vinegar to sanitize your cutting boards – a healthier option than using bleach. This is especially important after using the cutting board to cut up meat. Spray apple cider vinegar on mildew stains in the bathroom. You can use pure ACV for this, or dilute it with some water and essential oils to make the bathroom smell fresh. Apple cider vinegar will help remove waxy residue on furniture or tables. Let the wax dry and scrape it off with your fingers or the dull side of a knife. Dribble a bit of ACV on the waxy residue that’s left, and wipe up. If you’ve ever wandered into a patch of poison ivy, you know how maddeningly itchy the rash can get for days, or even weeks. There are several over-the-counter treatments for poison ivy, but some of them are expensive. For example, one box of Zanfel poison ivy wash will cost you around $35. A less expensive option is to try apple cider vinegar. It works by quickly drying the rash and eliminating the itch. Using undiluted ACV, gently dab a small amount on your rash with a Q-tip. Let it dry completely, then reapply a few minutes later. The more apple cider vinegar you use, the faster your rash will heal. Because of its drying effect, the National Psoriasis Foundation states that apple cider vinegar can also be useful for treating psoriasis. I have mild psoriasis on my knees, and use apple cider vinegar to dry out the area and relieve itching. It works as effectively as the expensive over-the-counter lotion I was using at a fraction of the price. Keep in mind that applying undiluted apple cider vinegar to irritated psoriasis, or open sores due to poison ivy, can cause burning. Try diluting it with water at a 1:1 ratio to reduce skin irritation. If you’ve ever tasted straight apple cider vinegar, then you know that the flavor is a bit shocking. Well, the shock factor is behind ACV’s reputation as a proven hiccup eliminator. Mallory Kievman, and 13-year-old from Connecticut, even used this remedy to start a business. She invented apple cider vinegar lollipops, called Hiccupops, and they have one purpose: curing hiccups. She told the New York Times that the vinegar overstimulates the nerves in the back of the mouth, and cancels out the hiccup response. Next time you have hiccups that just won’t go away, try a shot of ACV and see what happens. Your body just might be shocked into silence. Apple cider vinegar can be an effective cure for sore throats. Bacteria can’t survive in high-acid environments, and when you gargle with apple cider vinegar that’s exactly what you create in the back of your throat. A good mixture to start with a 1/4 cup of apple cider vinegar mixed with 1/4 cup of warm water. Gargle with this at least once an hour. You can also try mixing one tablespoon of apple cider vinegar with one tablespoon of salt in a glass of warm water. Apple cider can be incredibly effective at relieving the itchiness from bug bites, especially mosquito bites. The reason is that it helps restore and balance your skin’s pH level. To use ACV for bug bites, simply dab some of the vinegar straight onto your skin. You can also pour two cups into your bathwater and go for a long soak. If you want to start incorporating apple cider vinegar into your lifestyle, one easy way to consume it is in a salad dressing. There are many recipes online that combine apple cider vinegar with olive oil, shallots, honey, fresh herbs, and mustard (which can help hold the oil and vinegar together). You can also drink apple cider vinegar; however, you should mix it with something else. Drinking straight vinegar is not tasty, and it’s not good for your throat, esophagus, or teeth. I like to drink unfiltered, unpasteurized apple cider vinegar mixed with water (one tablespoon of apple cider vinegar in eight ounces of water). It tastes like watered-down apple juice, and its pleasant taste helps me stay hydrated throughout the day. Drinking a glass of apple cider vinegar mixed with water before a meal might also help you eat less. Taken after a meal, it might help reduce your craving for something sweet. Try mixing one teaspoon of ACV and one teaspoon of honey with eight ounces of water. You can also add other spices like ginger, turmeric, red pepper, or a bit of salt. There are many apple cider vinegar “tea” concoctions online, so experiment and find a combination you like. Another option is to mix apple cider vinegar in with a smoothie. Some people claim that apple cider vinegar is useful for whitening your teeth. Putting apple cider vinegar on your toothbrush, or using it as a quick mouth rinse, can help remove surface stains. However, the apple cider vinegar will do more harm than good, as it also removes tooth enamel. Another claim is that apple cider vinegar is effective for cleansing wounds. I don’t know if you’ve ever splashed vinegar on a paper cut, but it burns like fire. Soap and warm water is just as effective, and won’t reduce you to tears. Apple cider vinegar is a wonderful tool for living a healthier life and saving money. It’s not a cure-all for every ill, and many of ACV’s most-touted benefits aren’t backed by science; however, that doesn’t mean they don’t work. For example, since I started drinking apple cider vinegar daily, I’ve noticed my skin is rosier and in better health. I could not find any scientific evidence to prove apple cider vinegar is a boon for skin, but I know what I see in the mirror every morning. Do you use apple cider vinegar around the house, or to improve your health? What has your experience been?